Annan started his second visit to Damascus on Monday struggling to keep a pulse in his peace plan, while Assad is fighting for personal survival amid renewed international condemnation over Syria's interminable unrest. The slaughter of at least 108 people in Houla -- including 49 children and 34 women, say the UN, many of whom were gruesomely blown to pieces or shot dead at point blank range -- has overshadowed Annan's visit. The UN Security Council on Sunday strongly condemned the government's role in conducting a heavy artillery assault on the village, but its statement did little to bring the international powers together to end the crisis. The United States and European nations say the killings are a new sign of Assad's ruthless nature. "The evidence is not murky and there is a clear footprint of the government in this massacre," said Peter Wittig, Germany's UN ambassador. Russia though disputes the evidence and continues to defend its key Middle East ally. Foreign Minister Sergei Lavrov said Monday that world powers had to "play the game of fulfilling the Kofi Annan plan and not the game of regime change." Russia and the Damascus government continue to blame opposition groups and foreign extremists for much of the trouble. The Free Syrian Army and other rebels meanwhile say that the Houla massacre is another reason why they should not respect a cessation of hostilities that Annan brokered but which has never taken hold. Western experts say Assad could hold out for months. With the UN ceasefire monitors in Syria already coming under attack and violence worsening again, they hold out less hope for Annan's peace efforts. "Before Houla, Annan's diplomacy seemed to be adrift. Now he is in an even more difficult position," said Richard Gowan of New York University's Center on International Cooperation. "If there's any suggestion that he is soft on Damascus, he'll lose his remaining credibility with the West. But if Annan takes a very tough line, the Syrian government will simply stop talking to him altogether. He has very little room for diplomatic maneuver left." 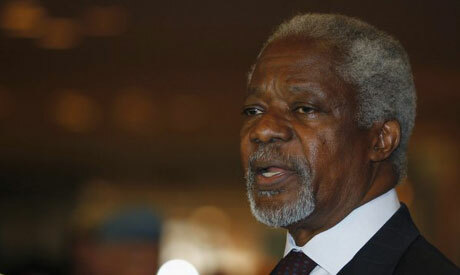 "The Annan plan is not dead," said Britain's UN ambassador Mark Lyall Grant. But in talks on the Middle East on Tuesday and on Syria on Wednesday the council needs "to have a serious strategic discussion" about the Annan plan and what the Security Council can do to help the special envoy make it work. "The Syrian regime cannot carry on forever violating its obligations -- without risking the end of the Annan plan," added France's deputy UN ambassador Martin Briens. UN leader Ban Ki-moon says there is no "Plan B" if the Annan plan crashes. Russian and Chinese opposition -- as veto-wielding permanent members -- means the UN Security Council would never approve international military action as it did in Libya last year. The second key international fear is over the more than 280 UN observers now in Syria. Ban said Sunday that the Houla massacre had added to pressure on the monitors -- the first UN force to be thrown unarmed into a conflict with a non-existent ceasefire. "United Nations observers are facing increasing criticism for not stopping the violence and, in some quarters, even being blamed for an increase," he told the Security Council. The UN force is "in a perilous position." UN convoys have already faced bomb attacks and are fired on nearly every day, according to UN officials. "Given the numbers involved, given the fact that they are unarmed and that they are escorted by Syrian security, clearly they are not equipped and they are not mandated to actually stop the violence," said Britain's Lyall Grant. "They do what they can but we have to be honest about their limitations," he added. The odds piling up against the UN mission are why some analysts such as Gowan are predicting that the Annan plan could go down as an "heroic failure".